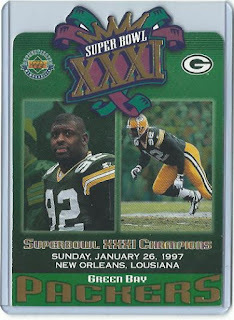 I also want to get caught up on cataloging my football card collection to TCDB. So far I'm complete through the year 2000. 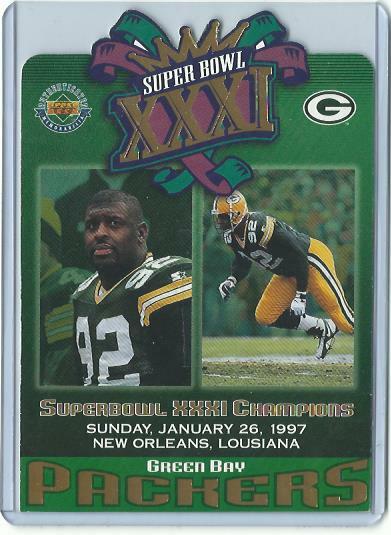 There aren't a whole lot of cards left to add, since I pretty much stopped collecting football around 2005. If I wasn't too lazy to make a graph (or take a pic) of the last 18 years of my football card collection you'd see 2001-2004 at about 100+, 2005 at almost nothing, and then spikes in '06 and '10 (due to that flat rate box I bought on eBay) Then a whole lot of nothin', then a big spike in 2016 (repacks and retail) very little in '17, and back to 100+ cards this year. This is kind of off-topic though..other than explaining why I'm doing a one-card post today. 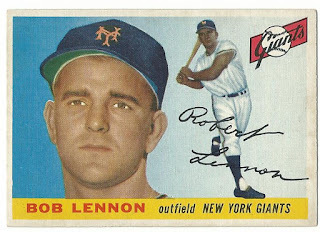 I still have two cards from my pre-Black Friday order in the "scan & post" folder, and I planned to include both in this post. But I decided to focus on baseball here and save the other one for the thrilling conclusion of The Basketball card Diaries. 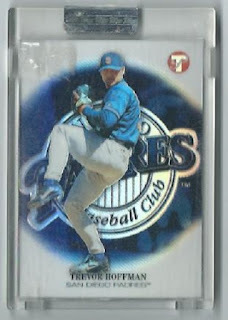 I've mentioned my love for 2002 Topps Pristine on this blog before. 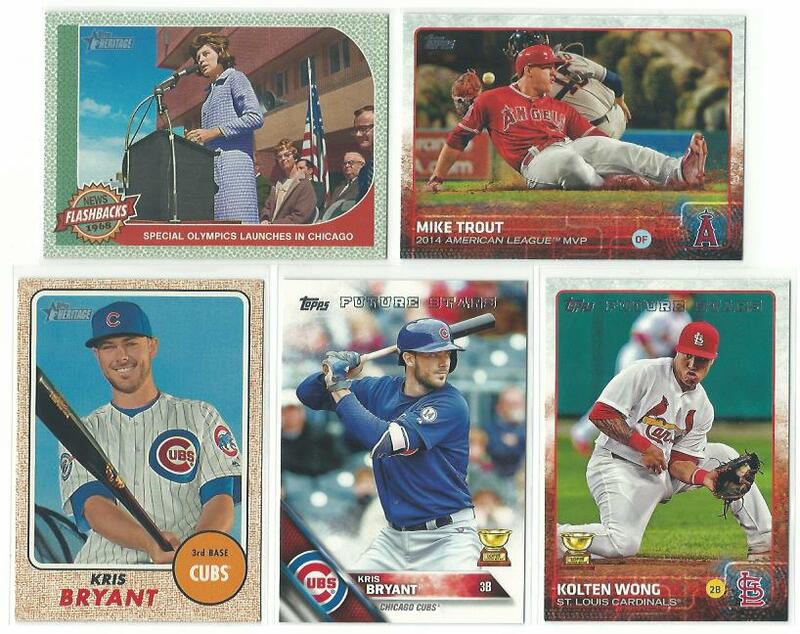 During the Black Friday sales I had a handful of base/parallel cards on my watch list. All are Hall of Famers. The only one I purchased (so far) is this Trevor Hoffman uncirculated refractor, serial #d to 149. When shopping for singles from sets I love but don't plan to complete, I often hit the ol' 'sort by lowest' tab and see what comes up. 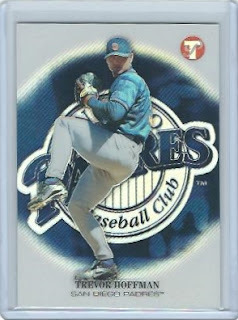 There wasn't another HOF refractor lower than this Hoffman, which set me back just $1.85. 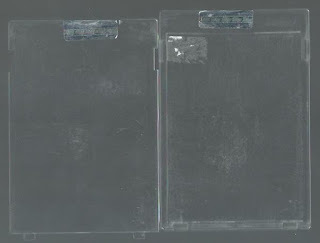 As you can see, the case is scratched up and has some sticker residue. I've kept my other uncirculated cards sealed, but when I got this card in-hand I knew what I had to do..
That little notch on the side was a bit tricky, but I got him out of the scratchy plastic prison and into a shiny new top loader. I didn't see Hoffman pitch a whole lot during his career, but he was a guy I rooted for (especially in 1998) and appreciated. He waited a couple years to get into Cooperstown but was elected in last year's jumbo-sized class of six players. This year another closer is certain to join him. Mariano Rivera is the only slam-dunk no-brainer on the 2019 ballot. Obviously there are plenty of players worthy of electing to Cooperstown, but no one that 90% of the voters will agree on. In fact I think this year's class will have only two inductees: Rivera and Edgar Martinez. I'm on the fence about Roy Halladay and Scott Rolen. As for Omar Vizquel, I plan to do a shortstop comparison post in the near future, like I did with Walker and right fielders. *Schilling's career accomplishments are Hall-worthy, but I shudder to think of what his induction ceremony will be like. If the writers could get away with being immature children I bet they'd slam the door on this guy. Alas. Who gets your vote on this year's Hall of Fame ballot? 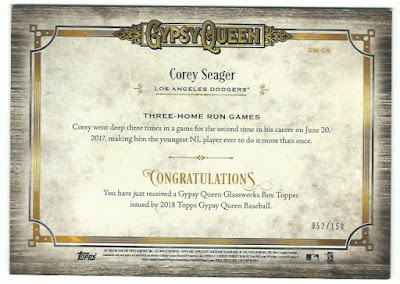 Earlier this year I read a blog post about these Gypsy Queen Glassworks box toppers and I made a mental note to find one for my collection. 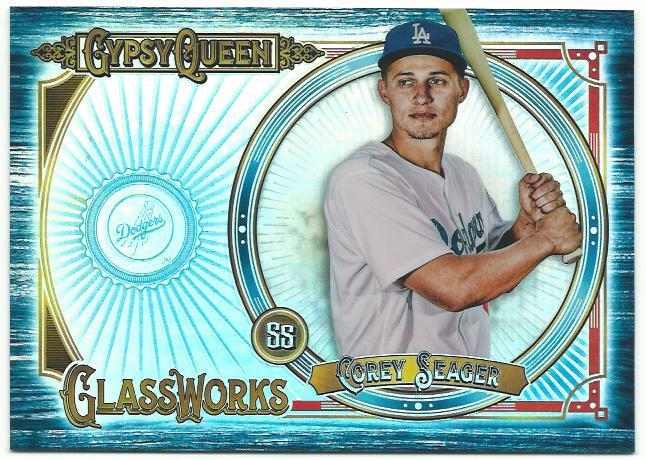 This Corey Seager card was one of only three 'indigo' parallels available, likely due to his missing nearly all of 2018 after Tommy John surgery..
..and the "surface impressions" on the back. 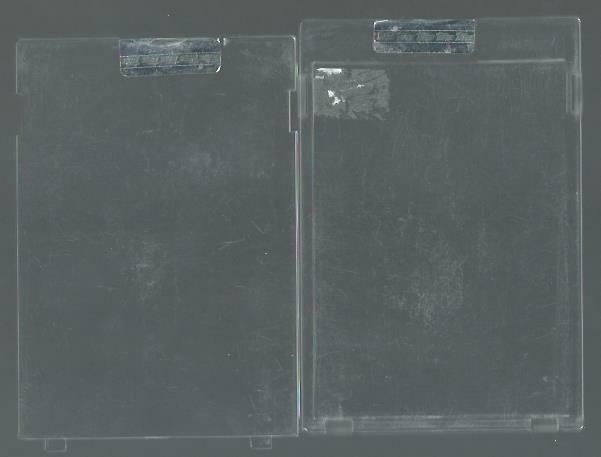 You can't really see it in the scan, but there is a pinhole-sized imprint and thumbnail crease to the right of the 20. 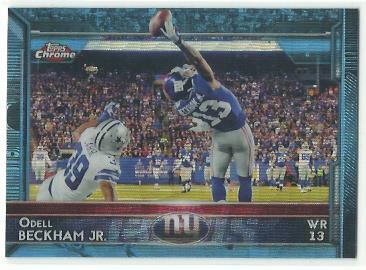 I don't mind slight flaws (the crease is a bit much) on most modern cards, especially box toppers. 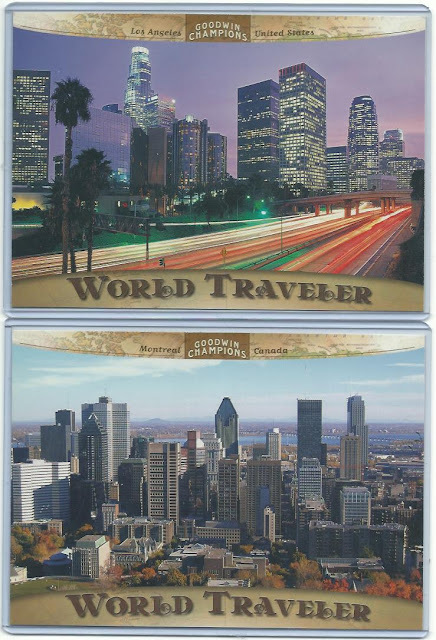 Perhaps it's because the 'value' of such things hasn't been instilled in me from decades of price guides, or perhaps it's because I just look at them like fancy postcards. These World Traveler box toppers both have corner wear. Didn't stop me from paying $3.48 for the pair (which, btw, was less than an Easter Island card sold for by itself.) I bought two more from this series during Black Friday weekend - Chicago is incoming but Vancouver will probably sit in my inventory for a while. This is another oversized card I couldn't pass up. $2.45 for a unique SB XXXI collectible sounds good to me despite the corner dings and surface scratch. 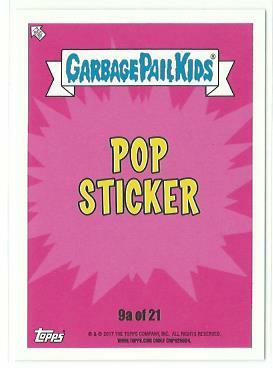 The four box toppers above cost a total of $10.52. 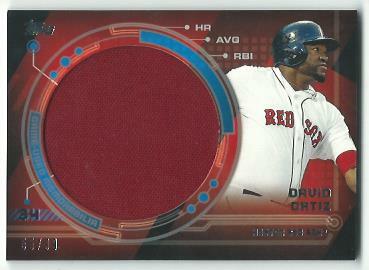 Big Papi relic here. This jumbo swatch takes up more than half the card. It's things like this that make staying away from COMC so difficult. The Black Friday sales also allowed me to finish a couple of sets. This Kris Bryant 2017 Topps Heritage SP is one of the last four I needed. 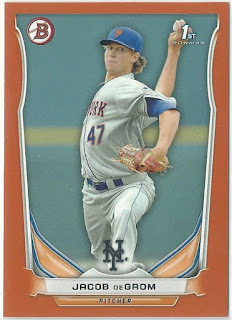 At $7.63, it was more than I paid for any single card in the set - SP, relic, or otherwise. I still need a ton of inserts though. 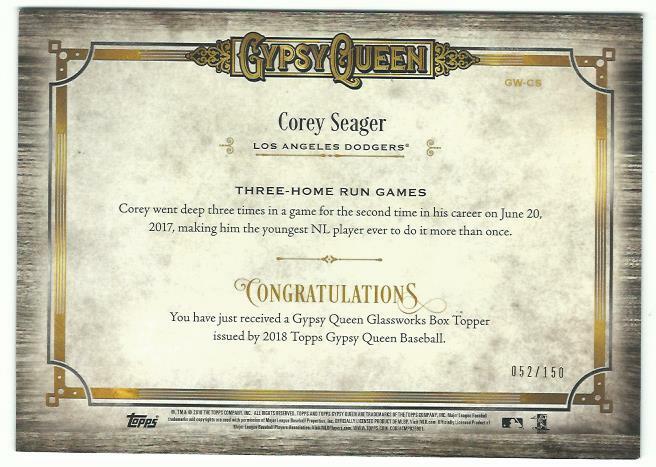 The flagship cards in this and other incoming orders bring me to within one card of completing the 2015 set (only need #617 Terrance Gore) and 2016 (need #1 Mike Trout). Also, I finished my OPC Platinum Hockey Frankenset. That will be featured in its own post. 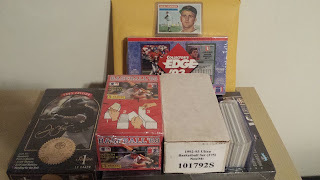 Huge mailday today..my box of old stuff from Kruk Cards arrived, as expected. I also got an e-mail from them stating they found a $15 shipping overcharge, which will be refunded later this week. Here are some cards I can show you. The '56 Bob Lennon looks a lot like the '55 Bob Lennon I gave away in the Sports Card Tour giveaway draft. ..but Impeccable is my new favorite. I saw a Ben Roethlisberger for a buck earlier this year and couldn't pass it up. When I got it in-hand I loved it so much I was determined to grab another single from this set. 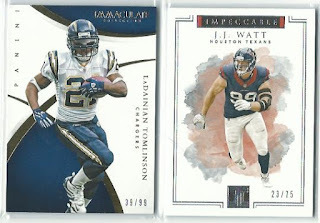 Missed out on Drew Brees, so I got Watt instead. 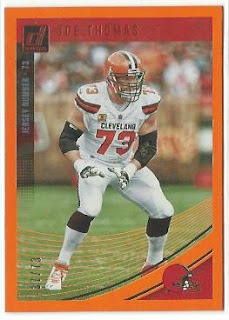 Finally added a Joe Thomas card to my collection - after he retired. I chose this Jersey Number parallel because it's color matching and it only cost $0.85. This Blue wave refractor is one of three color-matching Chrome cards depicting Odell Beckham's one-handed TD grab against Dallas (six if you count the Minis.) 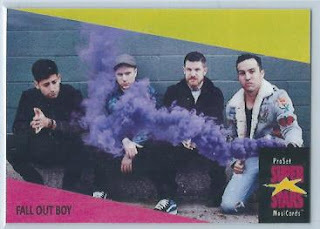 Overall, there are at least fifteen versions of this card. 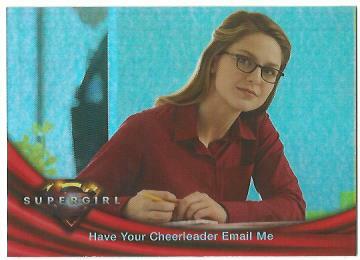 Can we pump the brakes on the parallels please? I'll end this post with some cards that would have fit with some of my prior posts. From my statistical comparison post about Right Fielders. My post about Franchise Players in baseball was popular. Perhaps I should write one for football? 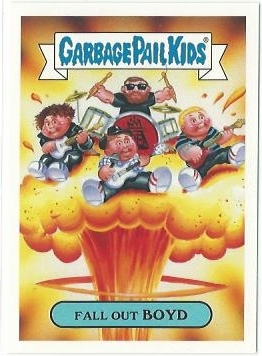 You know what bothers me about this Fall Out Boy(d) GPK sticker? Topps classifies them as a pop group. Whaaat? This next card fits two categories. As part of my Basketball card Diaries series I've been adding NBA cards to my wantlist that I'd missed out in in the 2000s. That's when I discovered that this exists..
..and hurried over to COMC to grab this copy. An absolute bargain at 48 cents. I've got more COMC purchases to show off but I'll save them for a future post. Think I'll tear into that Kruk Cards pile first. Should I start with 1993 Leaf, or something else? The first of my Black Friday purchases arrived today - though technically, these cards were bought before the big shopping holiday. Before I start to show off my purchases, I want to state something for the record. 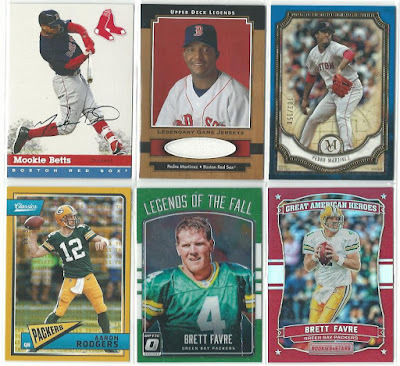 While I technically spent over $400 on sports cards this month, a great deal of that cash came from the sale of other sports cards - so I only spent about $80 out of pocket. A couple weeks ago I listed some high-end sets for sale on eBay in an effort to fill the PayPal 'pot'. Only one item sold: my 3-set lot of 2000 Topps Chrome Traded sets. I broke the "buy low, sell high" rule with these, but still managed to rake in about $200 (after fees and shipping). My plan was to divide that into two roughly equal 'halves' - one for COMC, and one for a "big piece" towards my 1956 Topps set build. $100 wasn't going to get me a graded Hank Aaron, Willie Mays, or Roberto Clemente (the top three stars missing from my set.) Perhaps the whole $200 would, but I wanted to spread the pool around and have a little more fun. Black Friday is my Christmas, after all. 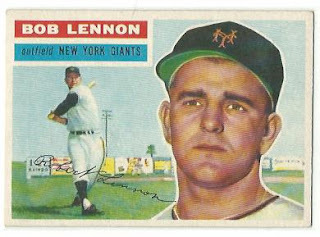 Focusing on mid-tier HOFers for my '56 set is actually kind of difficult. Harmon Killebrew is often out of the $100 range (it's his 2nd year card), and I bought the Ernie Banks last time I tried this. Roy Campanella was a possibility, but I didn't like the examples I was seeing. 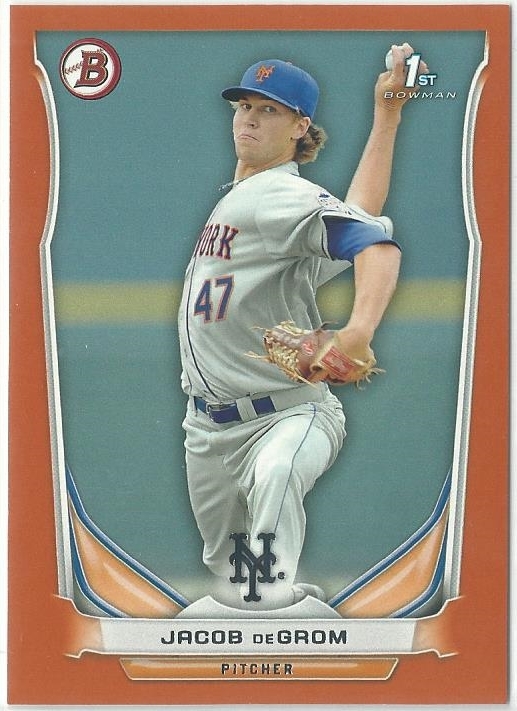 I offered up this Jacob deGrom Orange parallel on TCDB for $25. No one bit, so I sold it on eBay. That would have given me enough cash to cover the Kaline item I wanted...but then I got distracted. It started when I was window shopping at Blowout Cards, kicking the tires on their Black Friday sales. 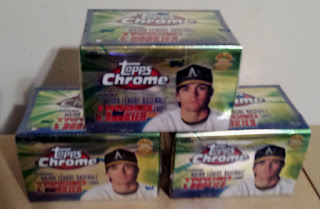 Their hobby box prices for flagship and Big League were unbeatable - barely more than a blaster. I filled my cart with about $80 worth of goodies, then cleared it. Why place an online order for the only cards I have easy access to (at Target)? That led to an eBay search... which led me to Kruk Cards. 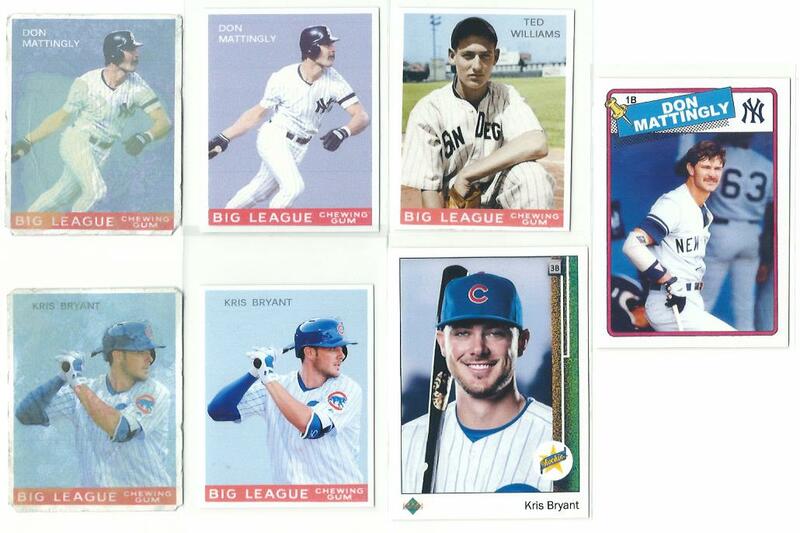 In the summer of '17 I was feeling nostalgic, and Kruk Cards had a whole bunch of items that brought back childhood collecting memories for me - specifically a starter lot of 1988 Panini stickers. I wrote a Buying Back My Childhood post about it at the time. 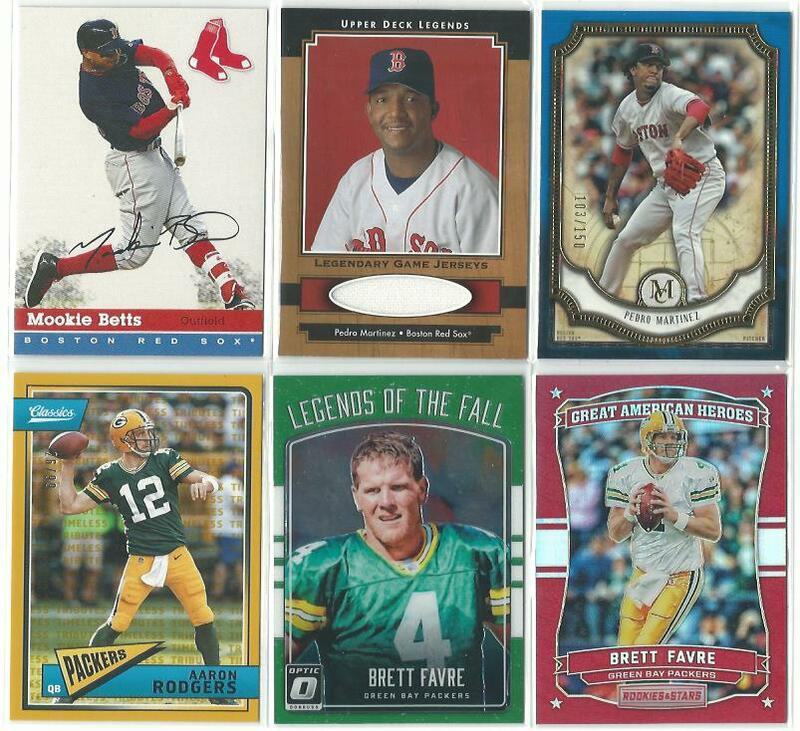 Last summer I spent $109.40 at Kruk Cards; this order was almost exactly the same price - $107.17. A big chunk of that was the cost of shipping; the items were on sale so I couldn't "commit to buy" without paying for them and eBay had a 15% off coupon that expired Wednesday night - after Kruk was closed. A woman in their customer service department assured me they would reimburse me for any overcharge, but the items were shipped yesterday so that seems unlikely. 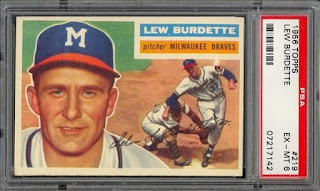 If Kruk Cards does issue me a partial refund it will cover the cost of another '56 Topps set filler. When I started adding cards to my COMC wantlist I found that one of the few graded singles I needed (that wasn't overpriced by Deans Cards) was a Lew Burdette. The PSA 7 example on COMC didn't drop down into my price range, so I picked up this 6 instead. 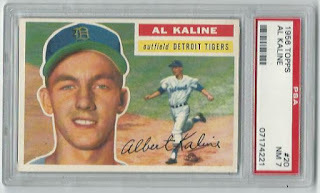 At $9.50+ shipping it was a full $50 less than the PSA 7's sale price. Considering the fees and cost of shipping the items I sold, this was basically a wash. In the next few posts you'll see what "old stuff" I bought from Kruk, and the first of my multiple orders from COMC - which should arrive Monday. This order contains a Secret Santa gift, and I wasn't about to make my recipient wait until Dec. 17 or later, so I paid $4 a week before the free shipping promotion began. How did you spend your time/money on Black Friday? Did you do all of your shopping online, or did you also shop in stores? Did you buy gifts for yourself, others, or both? 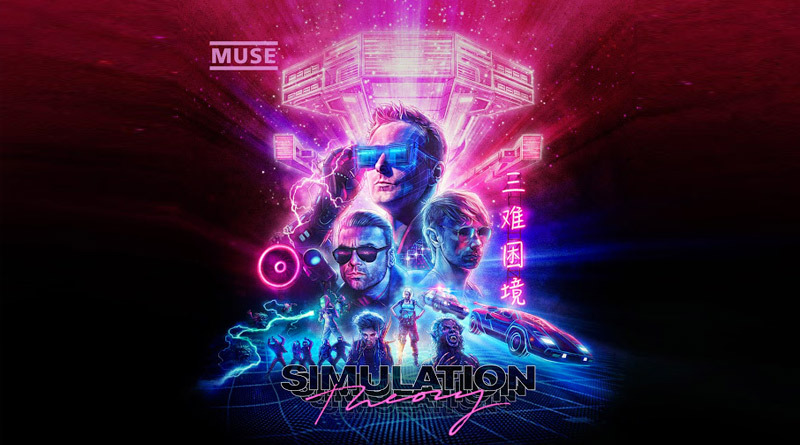 Muse released their latest album, Simulation Theory, about a week ago. 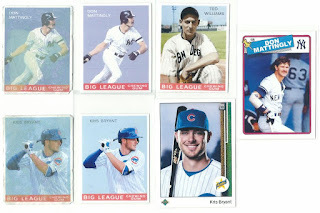 Leftovers from previous Baseball Card Breakdown creations. Gavin, I can't thank you enough for all the hard work you put into these. Much appreciated, my man! 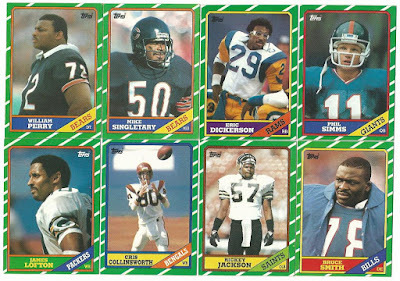 I'm still working on adding all of my football cards to the Trading Card Database, but I've already made a ton of progress with my 1986 Topps set build. User AirPete reached out to me while I was still working on basketball, about a possible trade. I told him I'd send him a PM when I was done adding all my basketball cards, since that's the focus of his collection. He composed an offer of epic proportions: the trade initially involved 840 cards, but Pete sent a second package of fifteen cards from '89-90 Hoops to replace two cards he could't find and one damaged Mike Singletary single. 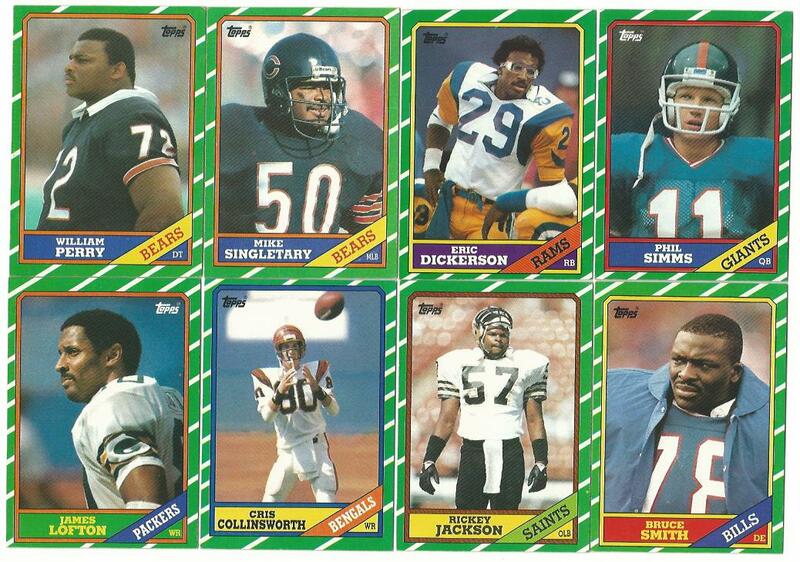 I now have 46.5% of the 1986 Topps football set, and I am very thankful for that. Sticking with football, I'm thankful for another very generous trader. Roy (aka Bulldog) of the blog Nothing If Not Random was responsible for one of the most generous trade packages I received all year - and I thanked him by attempting to write a post in under five minutes. Not cool, Chris. So, here's one last Thanksgiving thank-you to Roy, Gavin, and all of the very generous members of the trading card community who make this hobby so enjoyable. And thank you to those who have read and commented on The Pedestrian Writer throughout the year. I'm very thankful for your support! With that I'm going to take a short break from blogging, until my Black Friday purchases are received. Hope you all have a Happy Thanksgiving, and best of luck finding Black Friday bargains! 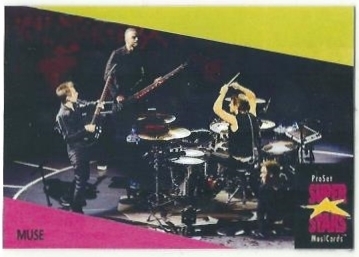 Since I resisted the urge to embed a Muse video I'll leave you with this instead. Enjoy! One day after publishing my statistical comparison post about right fielders ..Mookie Betts was named American League MVP. Mookie did it all for the Red Sox in 2018, leading the league in WAR, batting average, slugging, runs scored, and runs created. After a down year in '17, Betts' bounce-back season was so superb, one ESPN writer wondered aloud if he has passed Mike Trout as the best player in baseball. I am freaking the f*ck out that Betts will want a bigger contract than whatever Bryce Harper gets this off-season. He is absolutely worth 10 years and $350+ million, and while it is convenient to say "it's not my money" the fact is that if Betts doubles (or triples) his salary it will be very difficult for Boston to keep Chris Sale, Xander Bogaerts, and J.D. Martinez. Mookie Betts for Matt Harvey. Who says no? 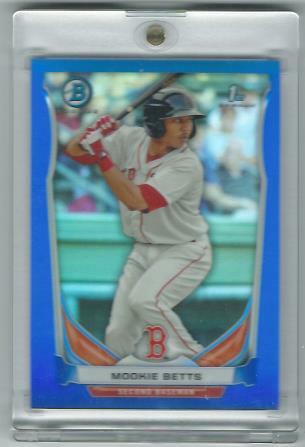 Fortunately the Sox moved Betts to a different position rather than a different team. I've been spoiled as a sports fan this year. Mookie is the second player from my favorite team to be named MVP of his sport. 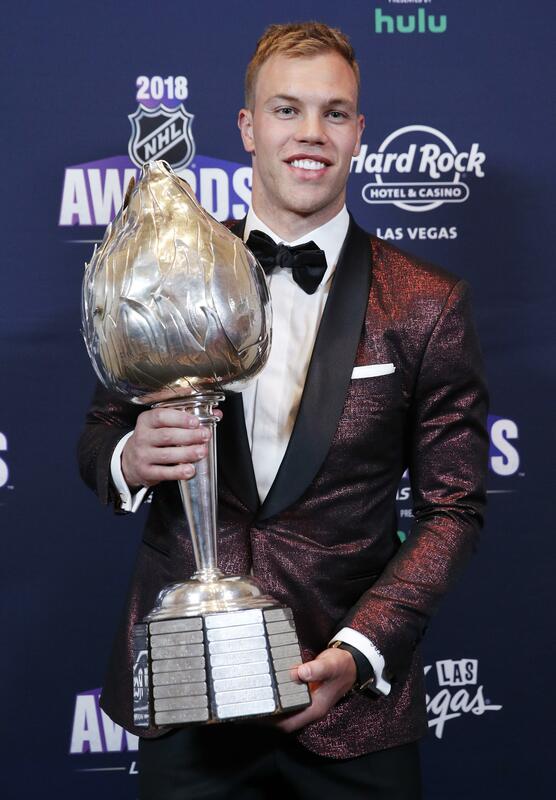 Devils winger Taylor Hall won the Hart Trophy this summer, a week after my favorite hockey player, Alex Ovechkin, finally won his first Stanley Cup. 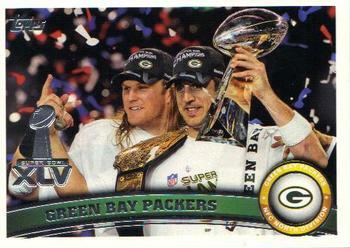 Which makes it hard for me to complain about the sub-par season the Green Bay Packers are having. I feel bad for Aaron Rodgers though. The front office needs to get their act together and surround him with a team that can contend for a championship. I'd much rather see him win another one of these.. 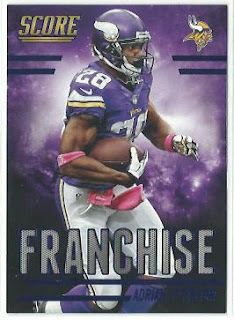 I've got a big football card post cued up, so that I can focus on preparing for Black Friday. While we wait for Bryce Harper to sign a record-breaking contract (coming off a season in which he was worth 1.3 WAR) I thought it would be fun to look at some other great Right Fielders. Does anyone else remember this commercial? It was the first thing I thought of when starting this post. It's been a while since I've done one of these statistical analysis posts; I planned to write about first basemen but nothing jumped out at me and then my internet connection was nearly non-existent for most of the summer. 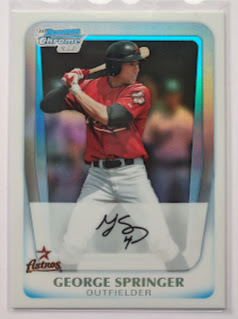 Also I've been buying (and selling) a few cards of right fielders lately, so I'll sneak some COMC purchases in here as well. Let's start with this - there are more Hall of Famers representing right field than any position other than pitcher. And yet there are still a handful both in and out of the Hall that are often overlooked. Not this guy though. The great Roberto Clemente is as beloved as any baseball icon. Statistically (based on career WAR) he's the sixth-best RF ever. However, due to his tragic and premature death after the 1972 season, Clemente played at least three fewer seasons than the five players ranked above him - including the slightly underrated Mel Ott and the very underrated Frank Robinson. In 1975 Frank Robinson was named player-manager of the Indians, becoming the first African-American to manage a team. Frank was also the second black manager in the majors, since no other men of color had been hired before he became the Giants' skipper in 1981. The average career WAR total for the 25 Hall of Famers who primarily played right field is 72.7. Eleven players met or exceeded this threshold, and ten of them are enshrined in Cooperstown. Clemente isn't the only great right fielder to play for PITTSBURGH. 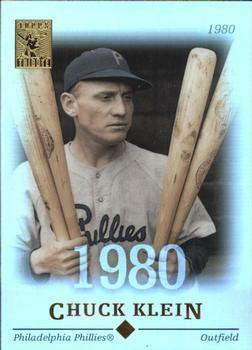 Paul Waner is tenth all-time in RF WAR and third at the position in career hits with 3,152 - nine more than Tony Gwynn. 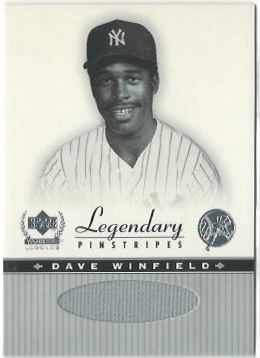 Dave Winfield is fifth on the career hits list for RFs. His 3,110 over 22 seasons falls just short of the 3,141 collected by the man who succeeded him in San Diego. Dave's career WAR is 64.2, lower than three players at his position who are not enshrined in Cooperstown. Joe Carter is 17th all-time in RBI by a right fielder, and collected as many extra base hits as Joe DiMaggio. That, and his unforgettable home run in the 1993 World Series, is enough to earn him consideration on this year's Veteran's Committee ballot. However he rarely walked, and his slash line of .259/.306/.464 only merits a career WAR of 19.6. 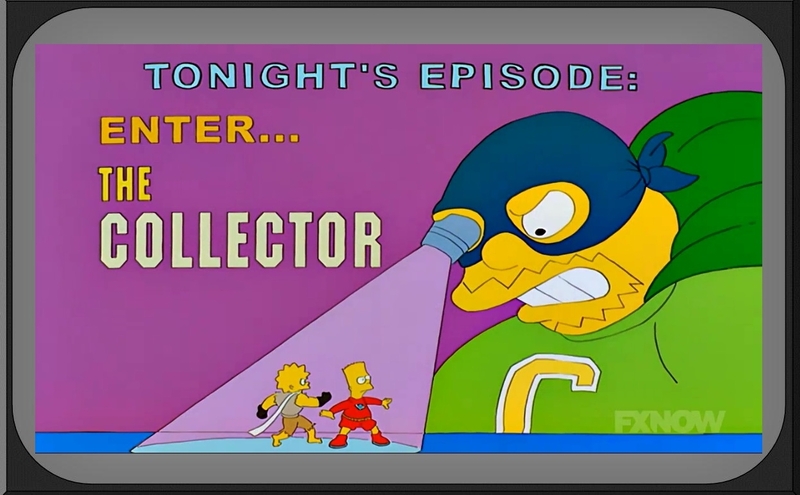 A quick note on some of the cards in this post before I get into a statistical comparison: I don't consider myself a 'flipper' and try to avoid the practice of profiting off other collectors. But with Black Friday approaching and these cards being listed at tantalizingly low prices, I was able to earn some extra cash towards future COMC purchases. The Clemente, Waner, Carter, and Winfield cards were all bought with flipping in mind - although I'd be happy to keep any that don't sell. The Joe Carter card in particular was a surprising find at $5.25; Thunder Clap inserts are rare - and Gold Medallion parallels are extremely so. I re-sold it within an hour for a nice profit, but I wasn't greedy. A Juan Gonzalez from the same set sold for over $66 on eBay; I asked for less than half that amount for Carter. Apparently the BBWAA feels the same way; Walker's Hall of Fame vote totals have been all over the place: 20.3% on his first try, 10.2% on his fourth. He had a big jump on the last ballot, to 34.1% - his highest total yet. Buuut he's still a long way from getting in, and he's running out of time. 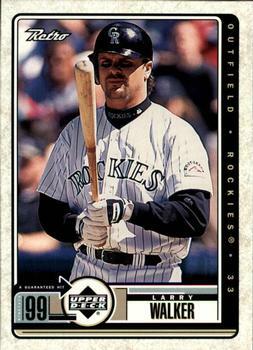 It appears likely that Larry will be the latest in a long line of RFs who didn't quite make the cut for one reason or another (not counting Joe Jackson, Sammy Sosa, or Gary Sheffield. We know why they’re not in.) Here's a list of ten other right fielders - five in the HOF and five out. Which side does Walker belong on? Klein’s slugging % blew me away – that's quite a high average for someone with only 300 career bombs - but then I dug a little deeper. It seems his home/road splits are as severe as Walker’s – if not more so – and his production dropped after a 1933 trade from the Phillies to the Cubs. Park factors aren't just a thin air thing. If you had a golden ticket to Cooperstown and you could only select one right fielder for enshrinement, who would you select and why? 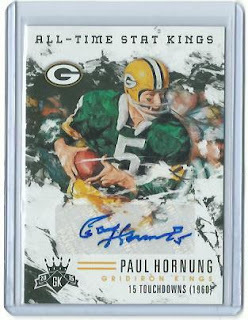 Are there additional RFs you would like to see in the HOF? Let me know in comments!